“In the restaurant business, you just can’t do it forever. 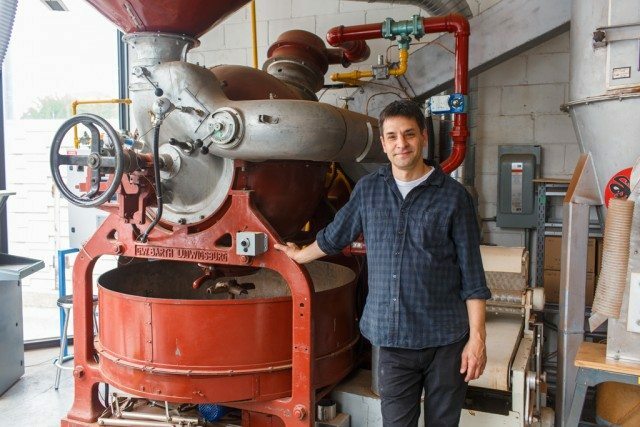 That’s a fact of life,” says David Castellan, owner of Soma Chocolate. After graduating from George Brown’s Baking Techniques program in the mid-1980s, Castellan, 49, spent more than 15 years as a pastry chef, rising through the ranks at Oliver & Bonacini during the empire’s influential expansion through the GTA. Castellan’s self-described “independent streak” led him to strike out on his own. In 2003, Castellan and his wife/business partner Cynthia Leung launched their specialty chocolate shop Soma in the Distillery District. They offered gelato, truffles, cookies, and small-batch chocolates, all in a 600 square-foot storefront that Castellan describes as “the Swiss army knife” of spaces. More than a decade later, Soma is now an internationally recognized chocolate maker. Their microbatch Porcelano bar won the 2015 International Chocolate Award for best dark chocolate bar. Soma opened a second store on King Street, and a Cocoa Bean Lab near Bloor and Dundas West. They start developing Christmas products in May to keep up with demand. Our interview with Castellan—about food trends, cocoa beans, and the international chocolate community (yum)—is below. Torontoist: You clearly have a high standard of quality for your products. When you’re importing so many different ingredients from overseas, from so many different suppliers, how do you maintain that level of control? David Castellan: Really, that’s the core of making chocolate. We have a lot of different product lines, but it’s very simple. We buy cocoa beans, we roast them, we take the shell off, we grind them into paste, we add sugar. It’s simple steps when you look at it. Buying the right type of cocoa beans that have been properly fermented is the first step, it’s the core of it. We have a bunch of different techniques for assessing quality. We do a cut test, we have a mini-melanger where we do sample batches. We’ve been around for thirteen years, so we’ve built a lot of relationships with brokers and cocoa bean suppliers. We’re able to discern easily what kind of beans we want to buy, and when they send us samples, if the beans are good or not. And we’re always getting better at that. Soma is constantly introducing new flavours and products. Tell me about the process of developing a new product. Where does inspiration come from? We work with our team, and we have certain types of products and lines that have been developed over the years. The truffles, for example: we have different flavours or different shapes or approaches. We’re always working on that. In essence, what we do at the Cocoa Bean Lab is make little bars. When it gets to the more complex stuff, Cynthia is a lot more involved. She spearheads a lot of the flavours, while oftentimes, I’m better with the shapes. We’ll have open discussion with the staff, and if they have a really good idea, we’ll take that and develop it. We also have other products, like the birch branch. That was a branch from Cynthia’s dad’s farm. She’ll often have a vision, and I’ll have the technical expertise, and we’ll try to figure out how to do it. For normal stuff like barks, which are a common product for chocolate shops, we’ll mess around with the ingredients and try to make it more interesting or use higher-quality ingredients. We do gelato flavours, which are a bit easier because there aren’t as many technical issues to work out. Cynthia does all the packaging, and she does all the painting and the artist-type stuff. Inspiration has to come from everywhere. It’s really being part of the food scene in general. We would get really cool, interesting ingredients from Quebec or Labrador, or architectural shapes. I’m working on one right now called an alloid, which is two interlocking rings, inspired by chainmail. Cynthia goes walking on her parents’ property in Lindsay, Ontario. If you can’t find inspiration in the world at large, you’re not going to get very far. When I saw the honey-butter truffle, I thought of all the news about bees and pollinators, and how butter is a big part of the Paleo diet trends. Do you think chocolate is that nimble when it comes to responding to food trends? When I started out in the 80s, to now, it’s a completely different world. Everyone is way more interested in food. When I started, you were basically a loser if you were a baker. It was the worst job you could get—it was one step up from being a dishwasher. That superstar chef thing didn’t exist at the time. In 15 years, the whole food superstar thing happened. I mean, look at Matty [Matheson]! He’s everywhere. It’s hard to talk about trends without sounding like you’re following something. We always end up kind of doing what we want to do. When we started, no one was doing bean-to-bar chocolate. We were doing truffles, and I had taken a course where I had done 500-gram batches. It might not be a money-maker, but I thought it’d be really, really cool to do this. We had a budget in the beginning, so we were able to buy some equipment that led us down that path. When we first started buying cocoa beans, the brokers would ask how many bags we wanted. We’d say we wanted three bags, and they’d be like, “Whatever!” At the time we were buying, in 2003, there were only 11 companies in North America that bought cocoa beans, and that’s including Cadbury, Nestle, Hershey. No one had a business making one-kilo batches of chocolate, which is what we wanted to do. That was the situation then. 16 years later, if you Google bean-to-bar chocolate, you’ll get a really long list. It’s like the breweries that are popping up everywhere. What changed in people’s interest in artisanal foods? Everyone appreciates their food. But the step toward appreciating the chefs that made the food, that had to happen in some way. Kitchens started to become open, and you wanted to see someone who was respecting the food they were cooking. A lot of companies rode that wave of people being more interested in food. I love being able to go to Fiesta Farms, have a choice of different types of butter to buy. I appreciate that. I like that it’s come that far. But then I look in the next aisle and there are way too many types of yogurt out there. When I first started in ’87 and I was working in restaurants, they’d have these uniforms for you. You’d go into the linen closet and there would be a jacket that would be five times too big or flood pants, and you’d look like a loser! Then this whole movement in California started, with people interested in fresh food, and companies started making nicer chef wear. Bit by bit, it started to become a little more respectable. And the guy we were aware of was Wolfgang Puck. And it became an interesting thing to do, to work with good food. People have become a lot more interested in ethical food over the last couple decades—ethical butchers, local farms, bean-to-bar chocolates—where they know every step of where their food came from. They’re more interested in storytelling. When you’re hiring people to work with your chocolate team, how do you do that job interview? Do you ask them to bring you a chocolate sample? In a kitchen, there are a zillion cooks out there and you can assess their skills and judge based on their resume. For chocolate making, there really aren’t that many chocolate-makers out there, and we’d probably want to train them anyway. We need basic food and pastry knowledge, but we train the rest of it. We look for bright, friendly people with good attitudes who can work together. The last thing you want is some moody artiste that won’t fit in. We work together every day, and it has to be fun. We don’t want to suffer for our art. There’s a lot of repetitive, physical work to do, and if you can’t hang around with cool people, what’s the point? When you look back at running a chocolate business over the last twelve years, what’s been the biggest surprise? When we started, it wasn’t called bean-to-bar. We used to call it microbatch chocolate, and it’s just chocolate that people make on their own. We had no idea when we started that it would be such a big thing. We look around and there are there all these people making bean-to-bar chocolate. There’s kind of a community of us now. There are meetings in San Francisco and New York, and there are a bunch of people we know with farms in Hawaii or who go to Nicaragua. It’s like an international network of chocolate people. It became that kind of a world.